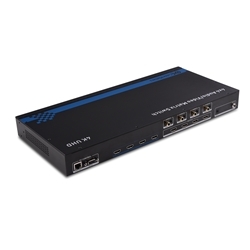 The Cable Matters 4x4 Audio/Video Matrix Switch is the perfect solution for switching any combination of HDMI sources to displays with HDMI input ports. Connect up to four devices to four separate displays and control each device independently with the handheld IR remote. Broadcast to a 4K UHD TV, monitor or projector in your home theater, conference room, classroom, or house of worship. Install the Matrix in a concealed location with the included mounting hardware. Connecting 4 separate displays is as simple as connecting HDMI cables. Configure and control the Matrix over IP with an RS-232 cable to a computer. Two 4K-rated HDMI cables are included. 2 x HDMI Cables - 6 Ft.